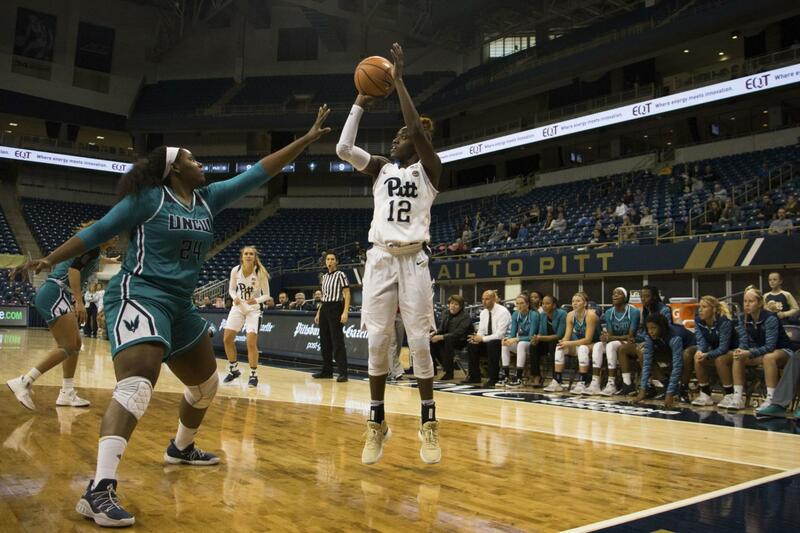 Pitt women’s basketball secured an easy win against University of North Carolina Wilmington Saturday afternoon, finally ending its losing streak. The Panthers (6-4) defeated the Seahawks (5-4) 74-55, earning them a win after three consecutive losses, which included two last-second defeats against Wisconsin and Fordham and a 20-point loss to rival West Virginia. Redshirt junior forward Yacine Diop got the game started for the Panthers with a quick layup, and sophomore guard Jasmine Whitney followed with another layup on the next possession. Both Diop and Whitney added a basket each and Pitt jumped out to a 10-3 lead with 6:03 left in the first quarter. The Panthers’ defense came up big in the quarter, forcing the Seahawks to turn the ball over eight times. Pitt scored 12 points off those turnovers. UNCW couldn’t find many good looks at the hoop, shooting 3-14 from the field in the quarter. Diop lead the Panthers in the first quarter, scoring 11 points on 5-6 shooting from the floor while also grabbing four rebounds to drive Pitt to a 23-9 lead. Pitt continued its offensive fluidity going into the second quarter. Diop continued to get to the basket, scoring the first six points of the quarter for Pitt and ending the first half as the top scorer with 17 points. The Panthers also saw some action off the bench from first-year guard Pika Rodriguez. She shot 3-5 from the 3-point range and for nine points, helping give the Panthers a 42-21 halftime lead. UNCW had trouble getting the ball in the basket, shooting 4-14 — 28.6 percent — from the field in the second quarter. The Seahawks managed to make two 3-pointers in the quarter, but ended 2-9 from the 3-point line at the half. The key player in the half for UNCW was sophomore guard Moriah Crisp, who scored five points and added two steals. Pitt made a majority of its shots in the beginning of the third quarter, going 6-9 — 66.7 percent — from the field. Walters found a scoring rhythm, making two buckets to get up to eight points in the game. The Seahawks once again could not get a lid off the basket, going 2-10 before the third media time-out. UNCW did start to etch into Pitt’s lead after the time-out, though. The Seahawks went on a 12-3 run to end the third quarter, going 4-7 and showing resistance against the Panthers on the defensive side of the ball. The Seahawks forced the Panthers to shoot 1-9 in that span, cutting their lead to 59-37 at the end of the third quarter. The Panthers still maintained a large lead in the fourth quarter that kept the Seahawks from making much of a comeback effort. Walters led the Panthers by grabbing five rebounds and adding four points, which gave her a double-double for the game. UNCW tried to do a full-court press at the end of the game, which forced junior guard Cassidy Walsh to turn the ball over twice on consecutive possessions. But Pitt was able to break the press and run out the clock thanks to a jumper from Diop and a layup from Walters. Pitt closed out the game with a 74-55 victory. The Panthers remain in Pittsburgh for a home game against Penn State Sunday, Dec. 17, with tip-off set for 2 p.m.